An abaca trader from Samar describes the Philippine’s angst-filled past to three brothers who emigrated from Cadiz, Spain, in the late 19th century. 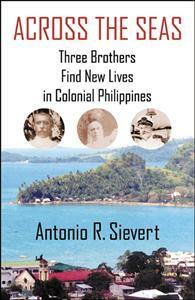 This non-fictional narrative is the story of three brothers, Carlos, Jorge and Jose Sievert y Barriere, who in the late 19th century made the courageous decision to leave their home in Cadiz, Spain, for the Philippine Islands, the last of Spain’s colonial possessions, in search of a more rewarding life. The new immigrants learned about their adopted country’s turbulent past, affecting both Christian and Muslim natives, and its cultural and economic transformation from Andres Reyes, a successful abaca trader, born and raised on the Visayan island of Samar. I must say that I enjoyed reading "Across the Seas"! The book is full of information and history( Spain's Colonization of the Philippines). The arrival of the three Sievert brothers fascinated me a lot! They showed great courage in leaving Cadiz and determination to find a better life in colonial Philippines.The author deserves much praise for his extensive research work,diligence and patience in writing the book.I would therefore rate this book a "5 star".